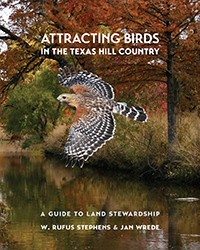 After years of working with landowners, land managers, naturalists, county officials, and others about wildlife management and land stewardship for birds in the Texas Hill Country, biologist Rufus Stephens and educator Jan Wrede teamed up to write a practical guidebook on how to improve habitat for birds on both small and large properties throughout the Hill Country. Because each bird species has specific needs for cover, food, water, nesting, and rearing their young, the book is organized by Hill Country habitat types: wooded slopes and savannahs; grasslands; rivers and creeks; canyons, seeps, and springs; tanks and ponds; plus residential backyards. Each chapter contains an in-depth discussion of common problems and possible solutions for developing optimum habitat. The book showcases 107 species in their habitats with color photographs and a short descriptive account of how to know the bird and care for its habitat. Three additional chapters on predator control, deer management, and cedar management offer detailed information on these special issues that impact the presence of birds throughout the region. As a comprehensive guide to habitat assessment, identification of birds and the habitats they use, plus stewardship practices that will benefit these birds, Attracting Birds in the Texas Hill Country offers landowners the ideal “how to manual” for writing an effective Wildlife Tax Valuation plan. By helping readers recognize and evaluate habitat health and then use appropriate habitat enhancement practices, the authors hope to inspire and enable widespread and effective bird conservation in the Texas Hill Country. And as bird populations flourish, so do the populations of other wildlife.